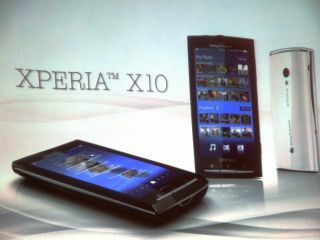 The Sony Ericsson Xperia X10 is set to pop up on Vodafone in the UK in the near future. The network has now made it available for 'registering your interest' on our shores, with an estimated UK release date of April at the moment. However, there's no word on UK pricing at the moment - although we'd expect it to be towards the higher end as this is a pretty feature-packed phone. Sony Ericsson back to its best? The X10 has the latest Qualcomm Snapdragon processor, with 1GHz of grunt, as well as a the new Mediascape and Timescape overlay, offering possibly the coolest way of shooting through your Android phone. It has a huge 4-inch high-res capacitive touchscreen, as well as an Android-leading 8.1MP camera too. We're pretty excited by this phone, and we'd imagine Sony Ericsson is too - it's in need of a big-hitting smartphone after the recent efforts (such as the Satio) have disappointed somewhat. However, it will debut with only Android 1.6 on board (with an upgrade to 2.0 later on) so we'll have to wait a little longer to get the full force of the Android OS.